Above and below two: Amazing! 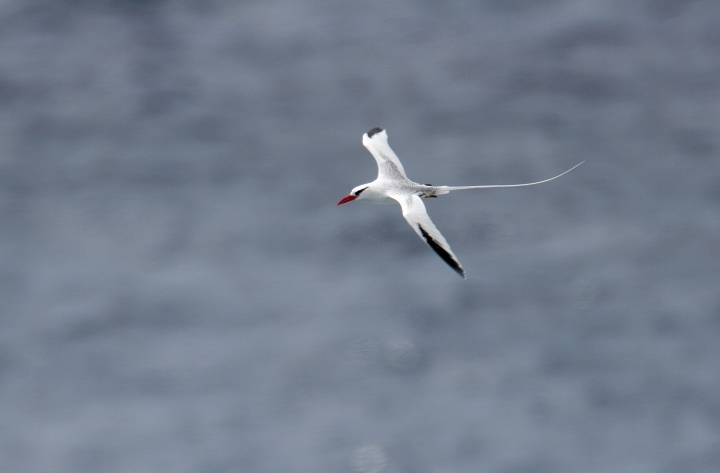 Hawaii's second-ever record of Red-BILLED Tropicbird. 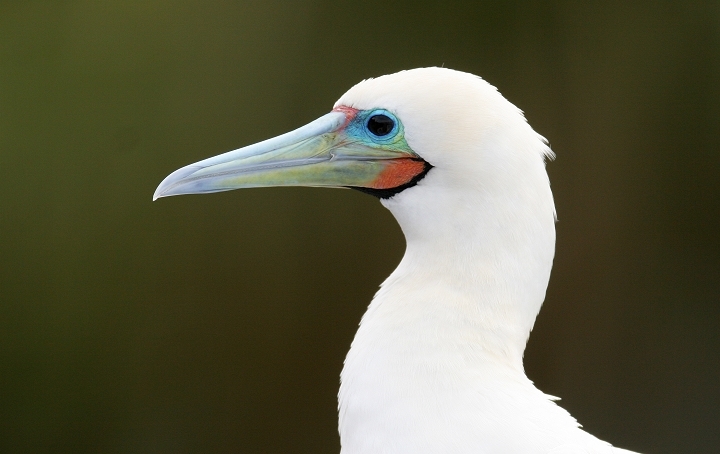 My girlfriend Becky and I photographed this beautiful bird in southeastern O'ahu on 3/19/2006. 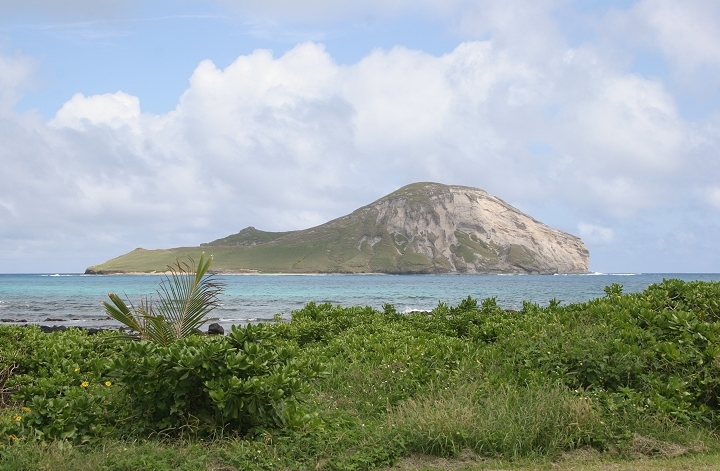 Below: Manana Island (or Rabbit Island), home to thousands of nesting Sooty Terns. 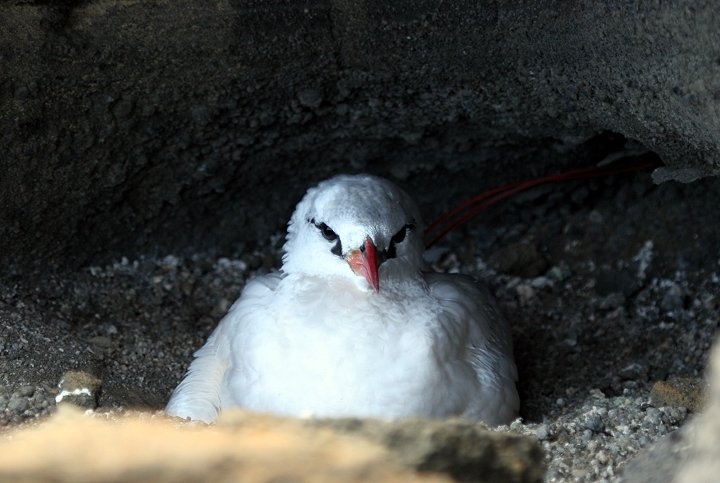 An hour of study from the beach (yes, it's a rough hobby sometimes) led to my first sightings of a Brown Noddy and at least two Gray-backed Terns (3/19/2006). 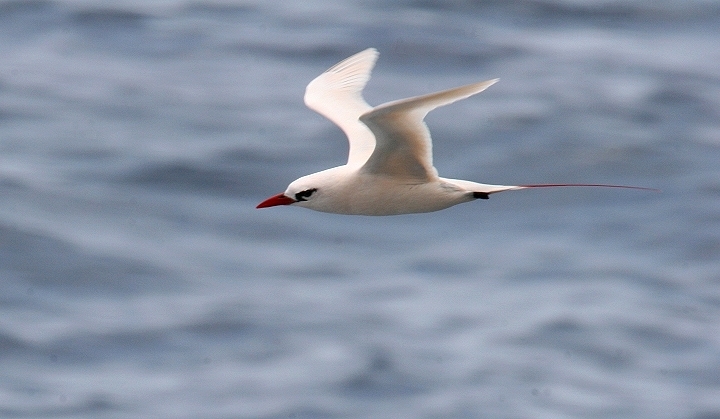 Below two: Nesting Red-tailed Tropicbirds in southeastern O'ahu (3/19/2006). 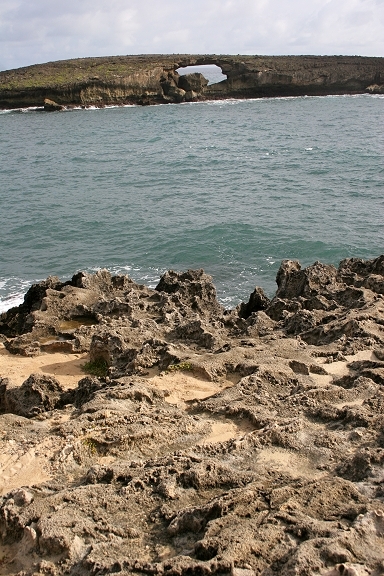 Below: Laie Point on O'ahu's North Shore (3/19/2006). 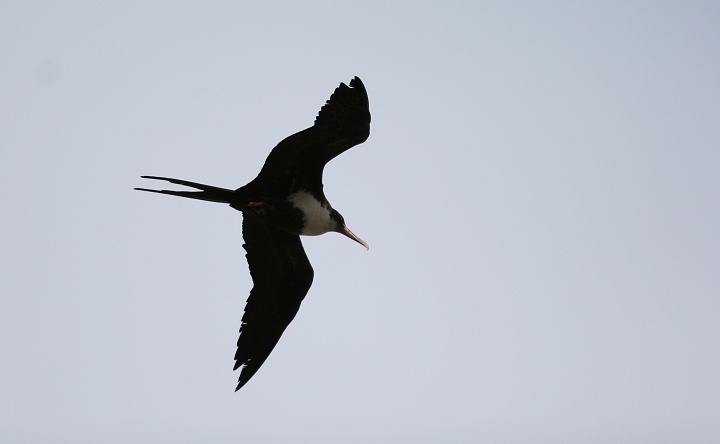 Below two: Female Great Frigatebird in southeastern O'ahu (3/19/2006). 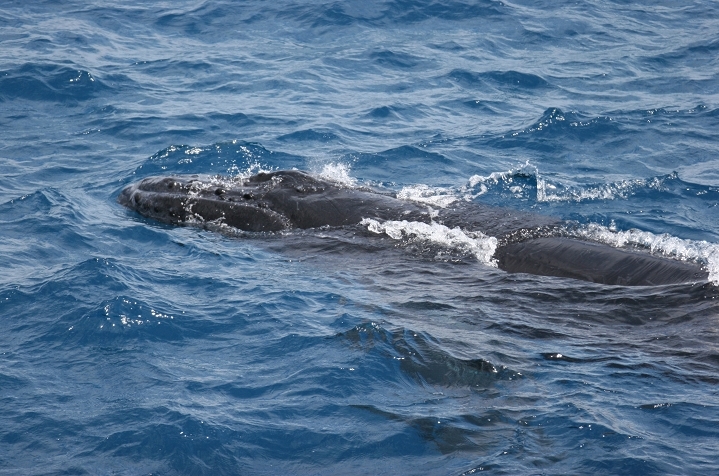 Below three: While photographing the tropicbirds, Becky and I were delighted to spot a beautiful Humpback Whale and her calf. 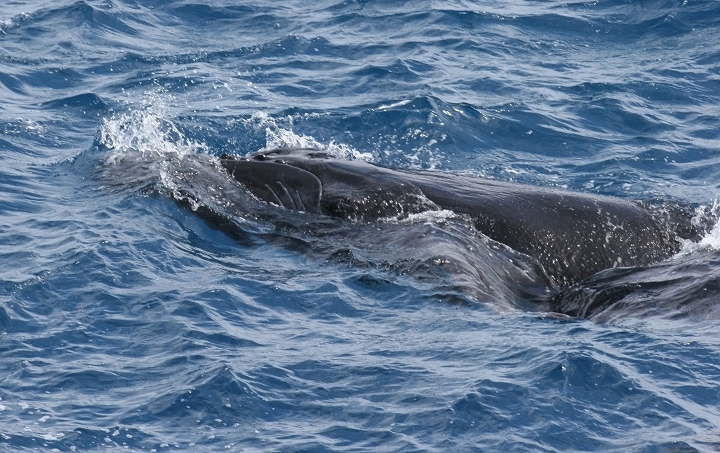 They were slowly working north just 30 yards from the coast (3/19/2006). 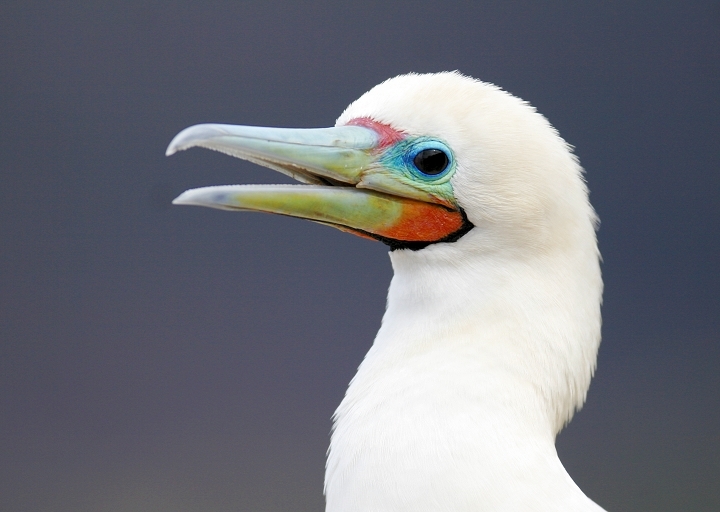 Below three: Red-footed Boobies in southeastern O'ahu. 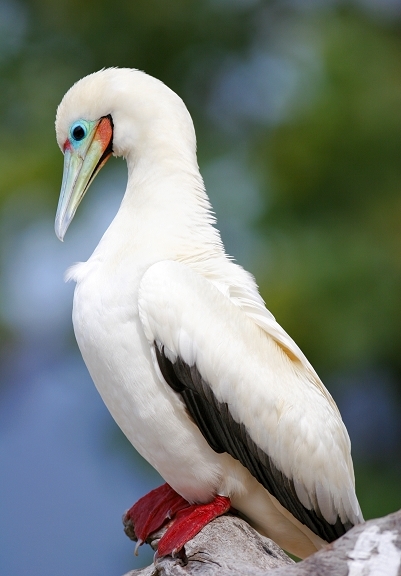 The island's Sealife Park rehabilitates birds, but these gorgeous Red-footed Boobies are free-flying visitors. 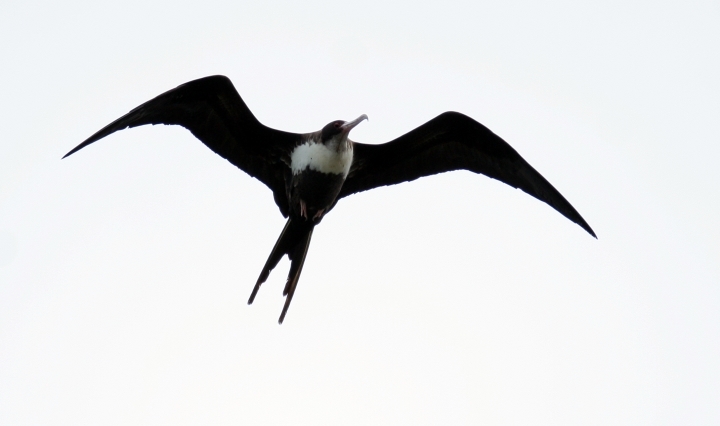 Below: Brown Booby at the park's rehabilitation center. 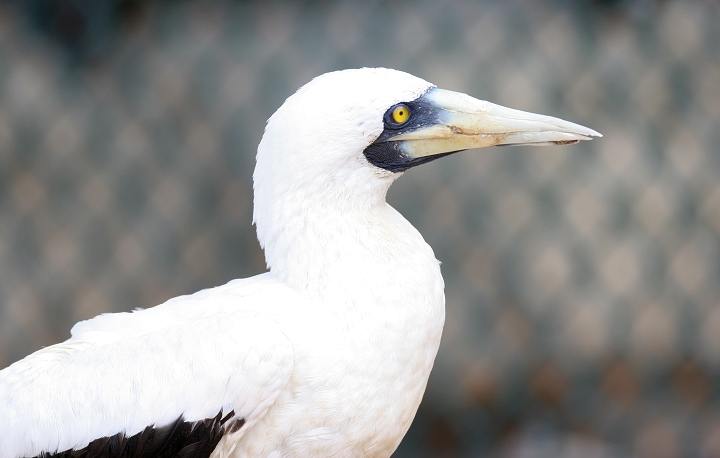 Although I've spotted several wild birds, this guy is under the park's care. 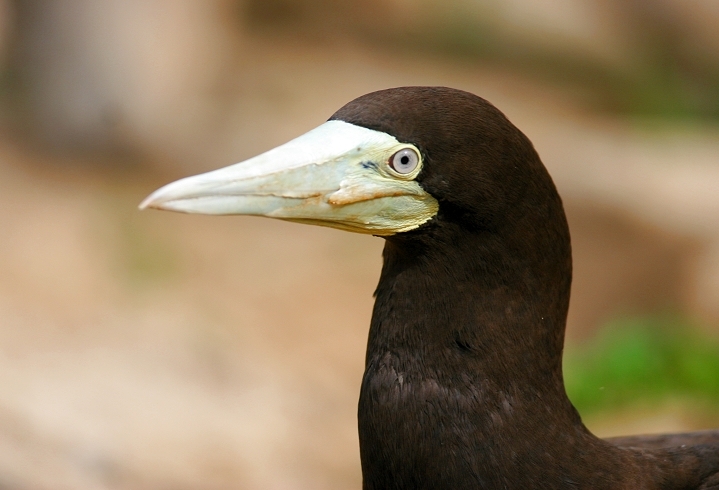 Below: Likewise with this Masked Booby. 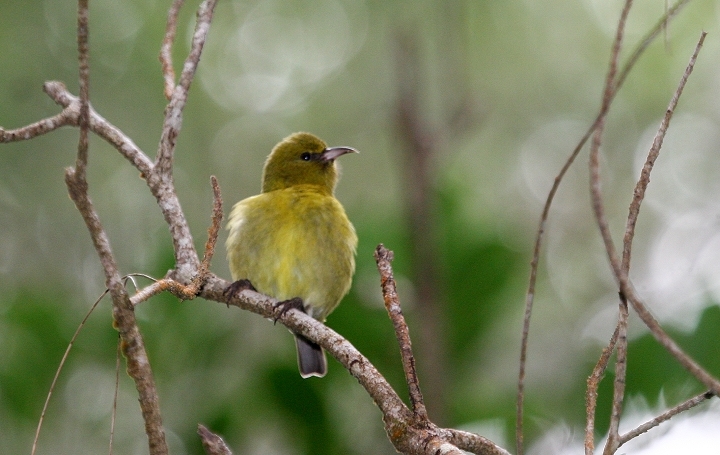 Below: Another attractive male O'ahu Amakihi in central O'ahu. 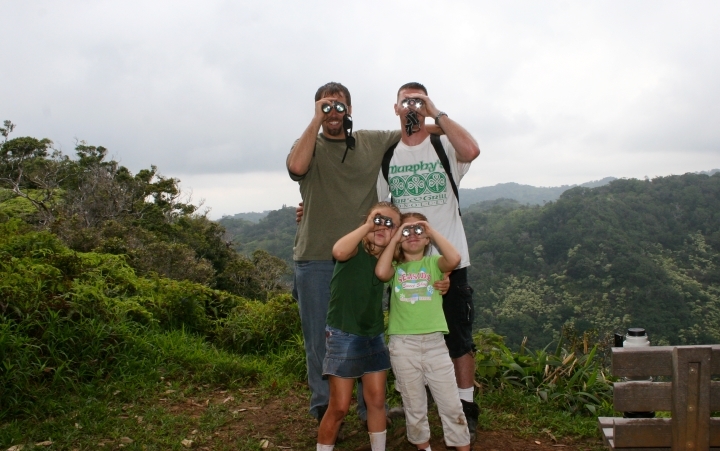 Below: Hiking and bird-watching with O'ahu's own Robey family - Jody and new birders Kristin (left) and Katelynn (right). Katelynn's going to open a zoo, and has informed her mom and dad that they will work for her. Photo by Stephanie Robey. 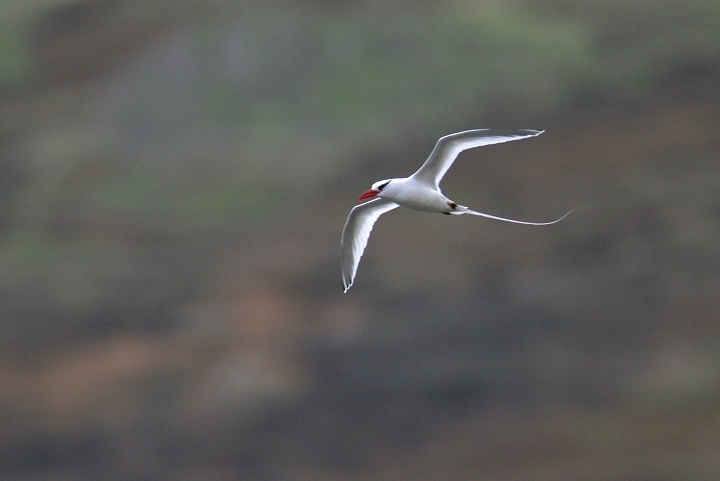 O'ahu sighting list so far (non-introduced in caps): HAWAIIAN DUCK (KOLOA) x MALLARD HYBRID, BUFFLEHEAD (1 hen), NORTHERN SHOVELER (8), NORTHERN PINTAIL (1 drake), Red Junglefowl (introduced by early Polynesians), WEDGE-TAILED SHEARWATER, RED-BILLED TROPICBIRD (! 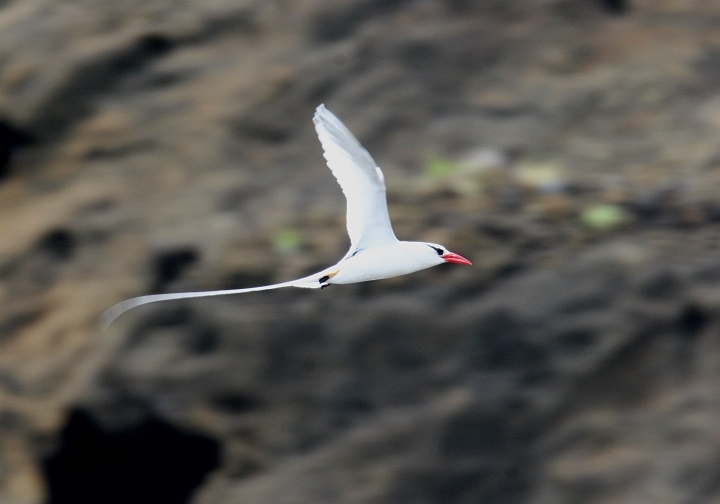 ), RED-TAILED TROPICBIRD, MASKED BOOBY, BROWN BOOBY, RED-FOOTED BOOBY, GREAT FRIGATEBIRD, Cattle Egret, BLACK-CROWNED NIGHT-HERON, HAWAIIAN COMMON MOORHEN, HAWAIIAN COOT, PACIFIC GOLDEN-PLOVER, HAWAIIAN STILT, WANDERING TATTLER, BRISTLE-THIGHED CURLEW (11), RUDDY TURNSTONE, SANDERLING, GRAY-BACKED TERN, SOOTY TERN (1000s at nesting colony), BROWN NODDY, BLACK NODDY, WHITE TERN (COMMON FAIRY-TERN), Rock Pigeon, Spotted Dove, Zebra Dove, Rose-ringed Parakeet, Budgerigar (escapee), HAWAIIAN SHORT-EARED OWL (PUEO; endemic subspecies sandwichensis), Red-vented Bulbul, Red-whiskered Bulbul, Japanese Bush-Warbler, White-rumped Shama, Red-billed Leiothrix, Japanese White-eye, Northern Mockingbird, Common Myna, Saffron Finch, Red-crested Cardinal, Northern Cardinal, House Finch, Yellow-fronted Canary, O'AHU 'AMAKIHI, House Sparrow, Common Waxbill, Nutmeg Mannikin, Chestnut Munia, Java Sparrow. 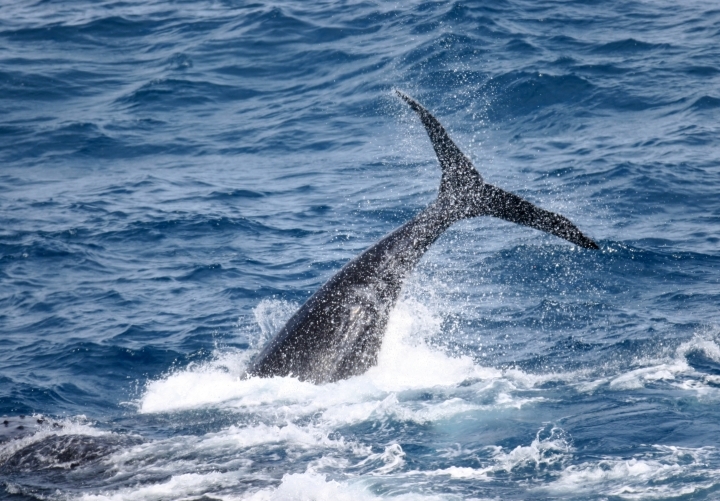 Mammals: HUMPBACK WHALE, Indian Mongoose. Insects: Long-tailed Pea-Blue, Gulf Fritillary, Monarch, Roseate Skimmer, Scarlet Skimmer, unid. Odonata (all introduced).